* R/C TANKS - Express Hobbies Inc. The M41 Walker Bulldog tank features a weathered olive drab paint scheme and is RTR out of the box. This M41 Bulldog tank comes with a plastic chassis, plastic road wheels, plastic return rollers, plastic idler wheels, plastic turret, metal drive wheels, metal caterpillar tracks, LED headlight, LED tail lights, plastic gun barrel, and metal gearboxes (Zinc, 3:1, H/L, 58mm). This tank also comes with an accessory kit, 2000mAh NIMH battery and charger, a smoke unit, speaker, recoil, and 2.4 GHz transmitter. The Taigen King Tiger features a two-tone camo paint scheme and is RTR out of the box. This King Tiger tank comes with a plastic chassis, metal drive wheels, metal idler wheels, metal road wheels, metal suspension arms, metal LED headlight, metal tow hooks, metal gun barrel, metal exhaust pipes, plastic turret, and metal gearboxes (Zinc, 4:1, H/L, 58mm). This tank also comes with an accessory kit, 2000mAh NIMH battery and charger, a smoke unit, LED machine gun, speaker, recoil, and 2.4 GHz transmitter. The Torro Sturmtiger Metal Edition features an ambush paint scheme and is RTR out of the box. This Sturmtiger tank comes with a metal chassis, metal torsion bar suspension system, metal suspension arms, metal track tension adjusters, metal idler wheel arms, metal drive wheels, metal idler wheels, metal road wheels, metal caterpillar tracks, metal tow hooks, metal LED headlight, and steel gearboxes (Steel, 3:1, M/L, 48mm). This tank also comes with an accessory kit, 2000mAh NIMH battery and charger, LED machine gun, a smoke unit, speaker, recoil, 2.4 GHz transmitter, and an easy access hull latch for accessibility. Taigen T34/85 (Metal Edition) AirsoftThe T34/85 Metal Edition features a winter whitewash paint scheme and is RTR out of the box. 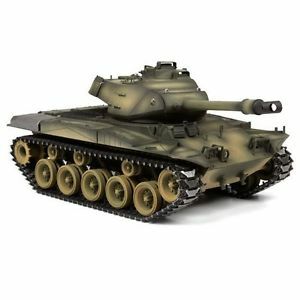 This T34/85 tank comes with a metal chassis, metal turret, metal hatches, metal gun barrel, metal suspension arms, metal track tension adjusters, LED headlight, metal road wheels with bearings and rubber tires, metal idler wheels with bearings, metal drive wheels, metal caterpillar tracks, turret roller bearings, steel gearboxes (Steel, H/L, 4:1, Special Shaft) and metal tow ropes. This tank also comes with our new 360 degree turret rotation system, accessory kit, 1700mAh NIMH battery and charger, dual LED machine guns, a smoke unit, speaker, recoil, 2.4 GHz transmitter, and an easy access hull latch for accessibility. The M4A3 Sherman 76mm Metal Edition features a two toned olive drab/black striped paint scheme and is RTR out of the box. This Sherman tank comes with a new design for the lower chassis, which is now over 2mm thick with a one-piece stamped lower hull. It also comes with a textured metal turret, metal gun barrel, metal hatches, metal VVSS suspension, metal idler wheels, LED headlights, metal road wheels with rubber tires and bearings, metal drive wheels, metal duckbill caterpillar tracks, steel gearboxes (Steel, 3:1, H/L, 48mm), and more! This tank also comes with our new 360 degree turret rotation system, accessory kit, 2000mAh NIMH battery and charger, dual LED machine guns, a smoke unit, speaker, recoil, 2.4 GHz transmitter, and an easy access hull latch for accessibility.